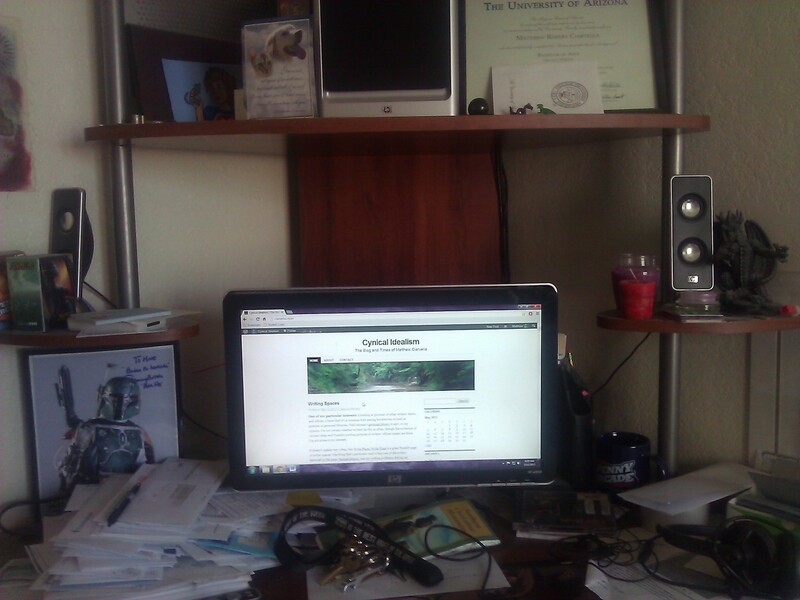 Yesterday, I talked about my affinity for looking at other writers’ desks. I also worried about the fact that my desk was so very cluttered and messy, and what this said about the state of my brain. 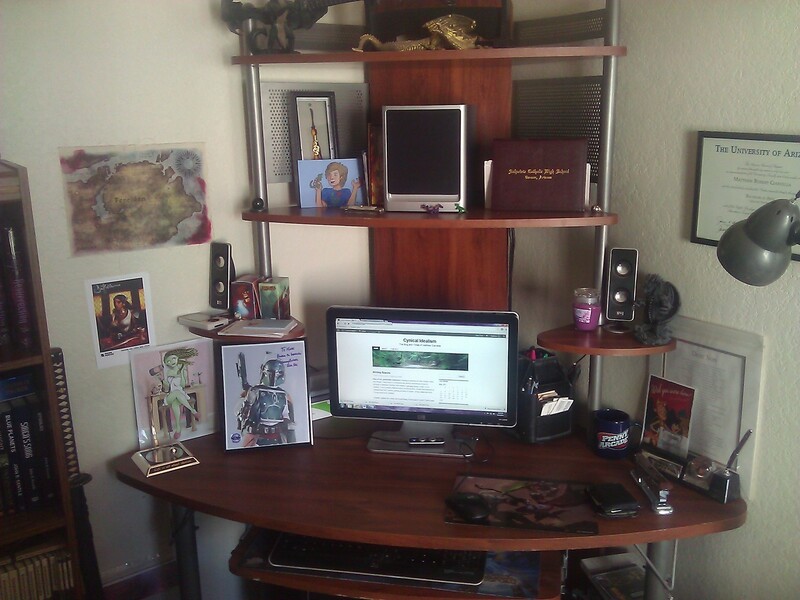 I resolved to clean up my work space and photograph the before and after so you can see the improvement. Well, the cleaning is done and the results are in. As promised, I took some before and after shots to chronicle the event. This will be an picture-heavy post so I’m including a page break. More below. 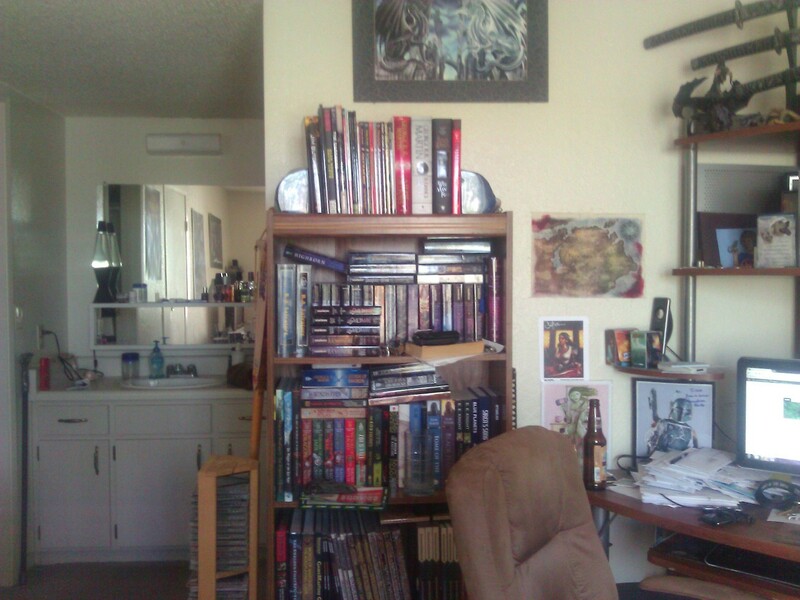 Here’s a shot of my bookshelf, which is in complete disarray. You can see that after running out of space, I just began stacking books on top of other books. I also seem to use my bookshelf as a convenient cup holder, which is a practice I’m sure will continue until I spill something and ruin my personal library. A closeup of the desk itself. You can see that thing are in bad shape. There’s the stack of mail on the left side which has buried my manuscript completely (you can just barely see the stack of pages beneath the mail). My car keys are there, as well as a topographical map of the Chiricahuas. The boxes of Magic: the Gathering cards are over to the left. 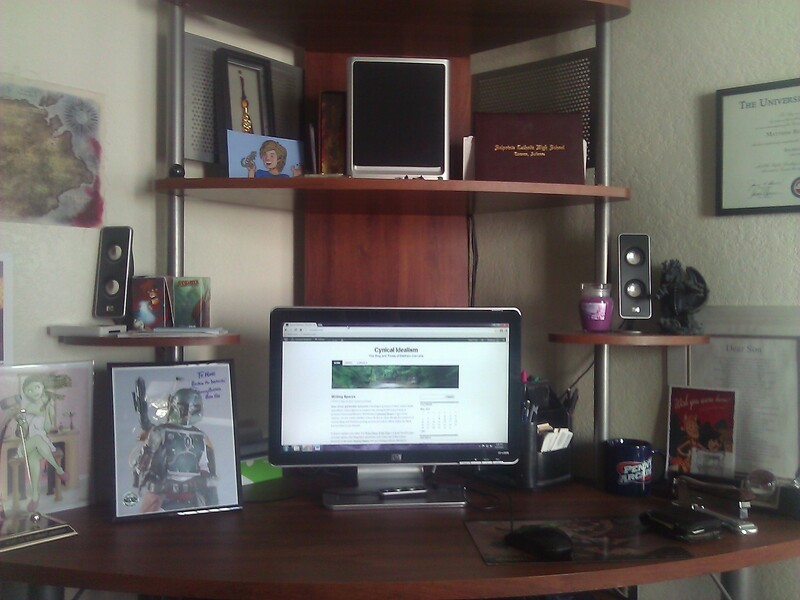 You can also see the signed Boba Fett picture (he’ll show up several more times) as well as my old Zune on the left. The rest of the assorted clutter would be too tedious to name, but feel free to make a scavenger hunt out of it. 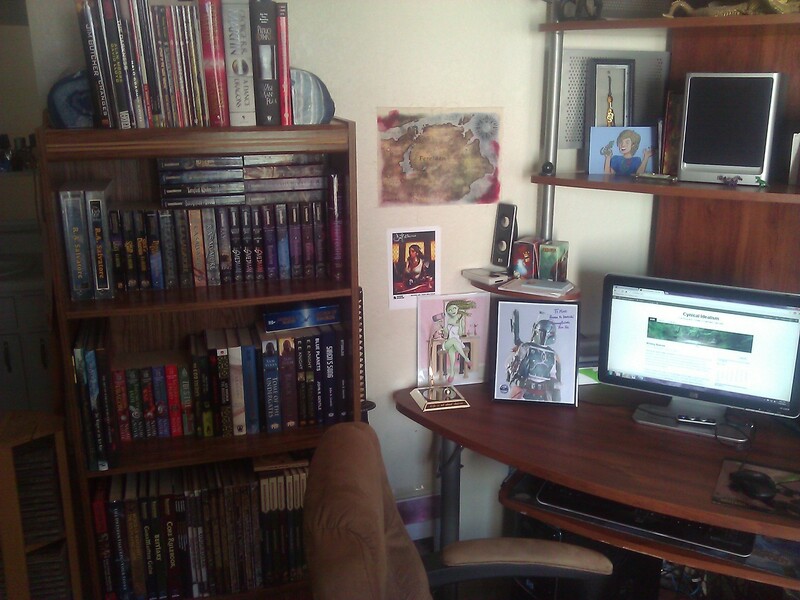 Here you can see my home office in full, which consists of my desk and bookshelf. I really do love my desk and although I appreciate all the extra space above and below my computer, it manages to accumulate clutter rather like a spiderweb accumulates flies. My collection of mementos and assorted stuff is rather eclectic and impressive only by virtue of sheer quantity and variety. That concludes the Before section of our tour. Starting off with the bookshelf again, you can see the improvement. No longer serving as a cupholder and somewhat arranged, the shelf no longer appears to be in complete disarray. I still have more books than shelf space at this point, even after moving several books out into my living room shelf. Still, overall, things look considerably neater. Here’s a closeup shot of the newly cleaned desk. 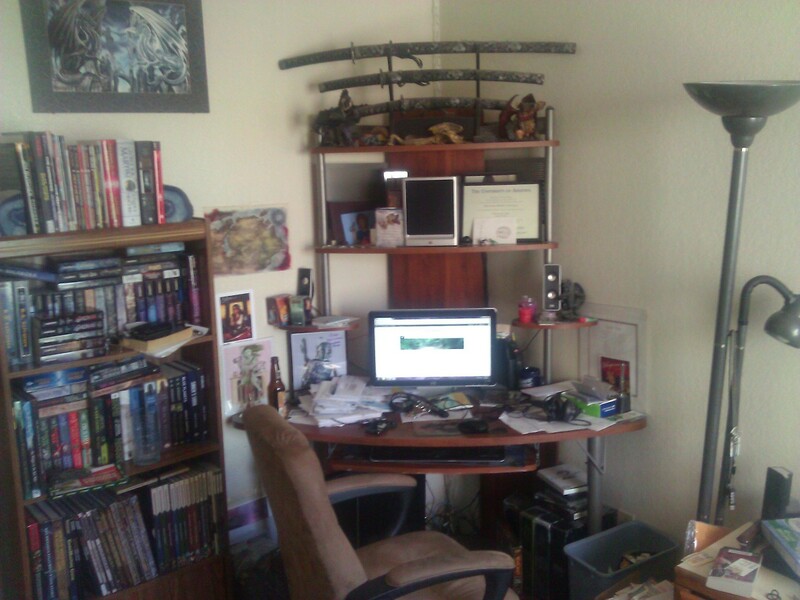 I tried to include the upper shelf as well to give you an idea of how much clutter I removed. I also decided to hang my diploma on the wall rather than just stuff it next to my computer speaker, because, hey, why not? You can now see the beautiful faux-wood finish, which is actually pretty slick looking even though it’s not the real thing. It’s certainly better than a five-inch stack of paper. This is the last picture of our photo tour, taken from a few steps back so you can see the desk from a wider perspective. The clutter is gone, the shelves are clean and dusted and it actually looks like the kind of place you could perform work rather than just using it to store junk. I’m sure this clean state will last for a week before I manage to trash it again. In my opinion, that was a productive use of a Monday morning if ever there was one. WOW!!!! As one who has been privileged to see your “before” and “after” many times, may I be the first to say ” WELL DONE”. I am so glad that you have pictures to save for posterity. Now, one small question….how long will this beautiful site last???? The current record for “how long will my desk stay clean” is 1 day and counting. Matthew, what is the current record for keeping your desk clean? Did it make it through the summer? I can’t imagine keeping my desk (or my office or house) clean so I commend you on taking the task on. Now, I’m back off to use my shovel to dig myself a pathway to my kitchen. The clean desk lasted for about a month before I started my grad school class a few weeks ago and it promptly fell into ruin again, although not as bad as in the Before picture. I’ll have to take care of it when I’m done studying and writing.